While working on issues that are slowing my computer, I wanted to turn off Mulitiplicity. I tried Task Manager but it would not allow me to end task - said it required Administrator. So closed user and opened administrator. Tried closing multiplicity and it kept reappearing, several time. So I went into apps and features and tried uninstalling Multiplicity. Got the message that I had to close multiplicity before uninstalling. Thought that was funny. Kept trying to uninstall and got the message "failed to initalize SdAppServices" Kept trying until in finally uninstalled. 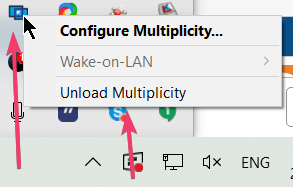 Is there a simple way to turn Multiplicity off and on. Or how can I stop if from automatically loading when I boot up so Mulitplicity will not open until I open the program. I will appreciate advice or solutions.